Photos and recipe updated August 2017. 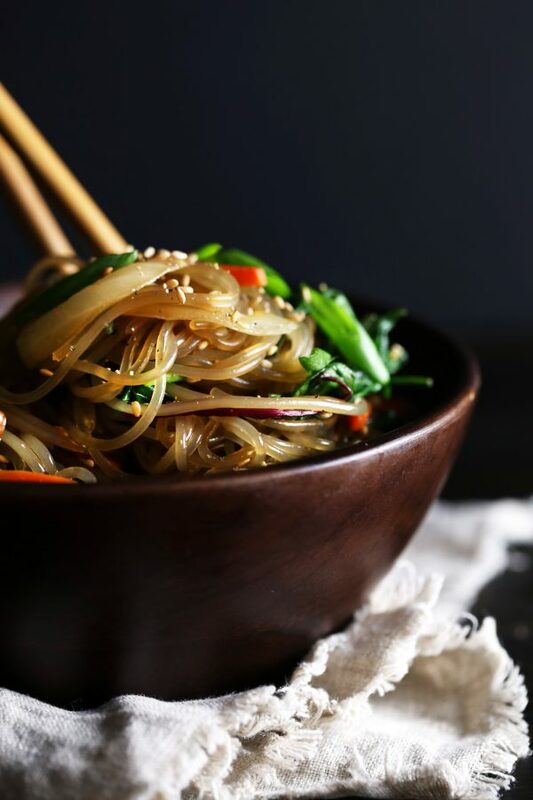 An Asian inspired teriyaki noodle stir-fry that’s full of delicious veggies and can easily be made gluten-free. This simple and delicious dish is sure to wow your family and friends! 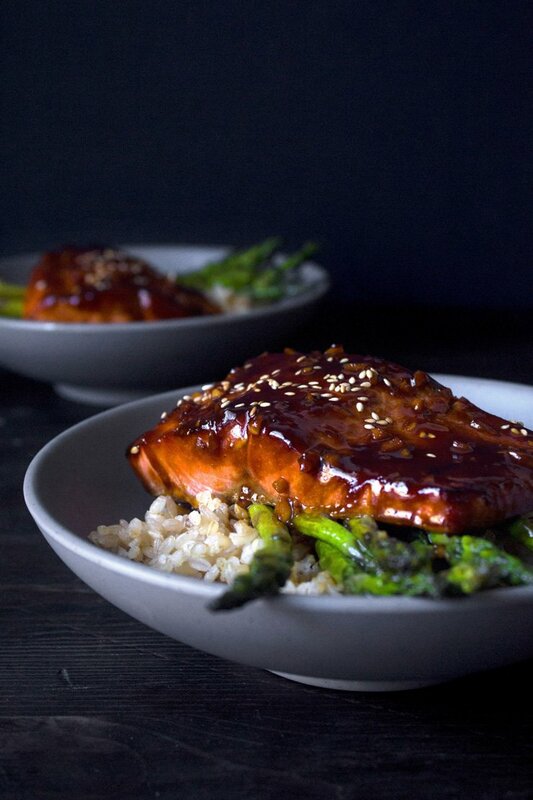 My family loves Asian inspired dishes and I’m always on the lookout for some quick and delicious meals to add to our dinner rotation. I found this yummy recipe from The Woks Of Life recently and new I had to try it. Since I didn’t have many of the listed ingredients for the sauce, I made my own adaptations based upon what I had on hand. The one thing I love about making stir-fries is that they’re a great way to rid your fridge of expiring produce. You can easily substitute many of the listed ingredients for things you may already have: bok choy, spinach, broccoli, asparagus, zucchini, yellow onion, etc. Some chicken or shrimp would be a delicious addition as well. Most any noodle will work for this recipe. If you have access to a great Asian market, you may find fresh lo mein, yakisoba, ramen, or udon noodles. If gluten-free, rice pad thai noodles or even brown rice spaghetti will work perfectly. Just be sure to only soak, not cook, the rice noodles beforehand, as they get can easily get mushy when over-cooked. This is a very easy and versatile dinner you can have on the table in less than 30 minutes. I hope you give it a try! Photos and recipe updated August 2017. This is a quick and easy Asian inspired dish which can be ready in less than 30 minutes! Substitute any of the veggies for some you have on hand. Feel free to add a protein, like chicken or shrimp, as well! If using regular ramen noodles, place noodles into a pot of boiling water and cook just until broken up. DO NOT cook the noodles fully at this point or they will not hold up in the stir-fry. Drain and rinse with cold water to stop the cooking process. If using rice noodles, place noodles into a bowl of hot water for up to 10 minutes, just until tender. Drain and rinse under cold water. Place a large frying pan or wok on the stove over medium-high heat. Add 1 tablespoon of cooking oil, along with the cabbage, carrots, bell pepper, mushrooms, and garlic. Sauté vegetables for 2-3 minutes until slightly tender. Add snow peas and green onions and sauté for 1 more minute. Add drained noodles and half of the teriyaki sauce. Quickly stir-fry on hight heat for 1-2 minutes, stirring constantly, until sauce thickens and evenly coats the noodles, adding the remaining sauce as needed. Serve immediately. Makes 2-3 servings. *Can also use 2–3 packets of ramen noodles, seasoning packets discarded. I’m making this recipe now I am a big fan of oriental dishes and I’m using shrimp and so far smells amazing mmmmm. Ooh, that sounds delicious, Frankie! I love your addition of shrimp…I’ll have to give that a try next time as my family loves seafood! Thank you for letting me know you gave it a try and I hope you enjoyed it as much as we did! I love noodle dishes and I love teriyaki sauce too! That means I am going to try this very soon! My entire family would love this for sure! Oh my! This just makes my mouth water! Looks really good! I think I must try this! Thanks, Gecca! I hope you get an opportunity to try it out. I think you’ll love it! This looks divine! Definitely going to be trying out this recipe! Thanks for sharing! Thank you, Valerie! Please let me know how you like it. I appreciate you trying it out. I hope you have a great week! Thank you, Sarah! It was so tasty, we ate it all up! I hope you have a wonderful week! Thank you, Vivi! I hope you enjoy! Yes! Love noodle dishes! The recipe looks easy . . . even for me! And the photography — gorgeous! Thank you, Bridget! It is a super easy recipe. Thanks for taking the time to comment! Oh that looks SO good, hmmmm – that just might be my dinner tonight!!! Thanks, Heather! I hope you enjoyed it as much as we have! Thank you for your comment! I hope you have a great week! Aw, thank you Cassandrea! I appreciate your kind comments. I love a good stir fry! I totally love stir fry for the same reason— it’s a great way to use up all those leftover veggies in your fridge in SUCh a tasty way! I love the combination of veggies you used in this. They add such a beautiful pop of color! Can’t wait to hear more about your homemade ramen noodles!! Noodles are my next go. I’ve only ever eaten it with rice and I have been missing out! I am excited to try it. How do you make homemade Ramen Noodles? 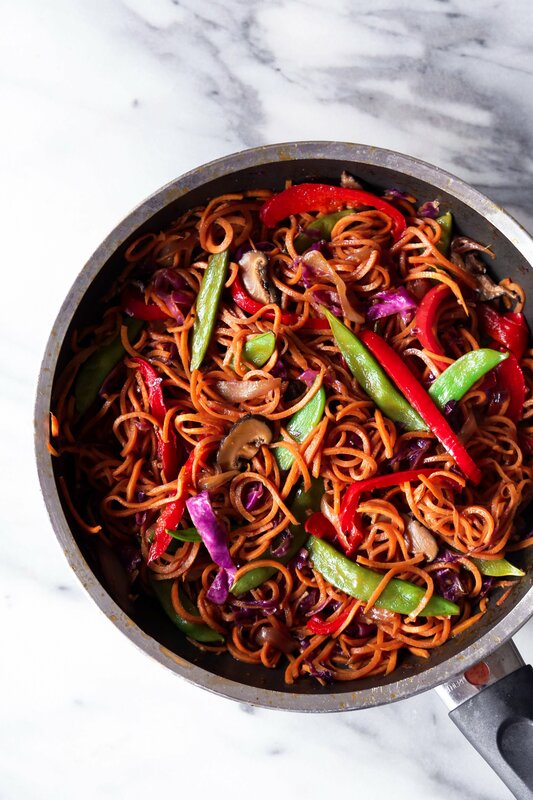 Oh this veggie noodle stir fry looks delicious and totally simple to make! I love a good healthy dish and this is it! Thank you for sharing this great recipe! Thank you, Ashleigh! It was a really simple recipe. It came out really delicious. Thank you for your comment! Hi, Melanie! Please let me know how you like it! Noodles are the way to my heart, Joscelyn! You know I love my veggies, so this is the perfect dish for me! I love love love asian inspired dishes, and your noodle stir fry looks even better than what I could get a my favorite ramen noodle shop! Who needs to make a trip to Chinatown in NYC, when I can make this recipe at home! Yum!